It wasn’t just your mother telling you to eat carrots for better vision. People have known for centuries that certain foods can be good for your eyesight, including 16th Century Spanish explorers who carried chili peppers on voyages to help with night vision. Your mom and the explorers were smart: those chili peppers contained beta-carotene, vitamins C, E and B6, and folic acid, and the carrots had carotenoids and antioxidants. A diet rich in these nutrients may reduce the risk of developing macular degeneration and slow the progression of the disease in those already diagnosed. The easy part of eating for eye health is learning which kinds of foods are best, foods like salmon, eggs, corn, blueberries, peppers, and leafy green vegetables. The hard part is finding fun, varied, and delicious ways to make them a regular part of your diet. 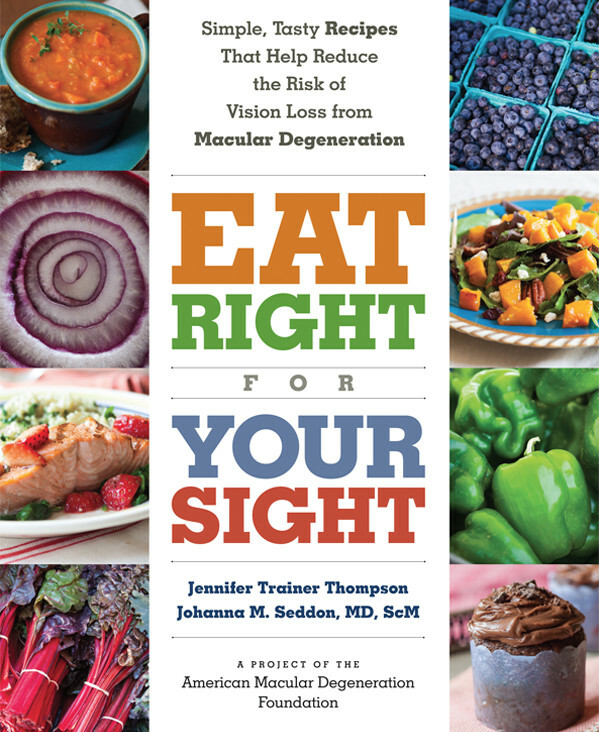 Eat Right for Your Sight™, by Jennifer Trainer Thompson and Johanna M. Seddon, MD, ScM (The Experiment Publishing, 2015) takes care of that, providing recipes that make healthy eating a treat. Seddon is one of the leading experts in the field of age-related macular degeneration, and Eat Right for Your Sight is a practical expression of her research, a way of incorporating the science behind vision health and overall well being into daily life. 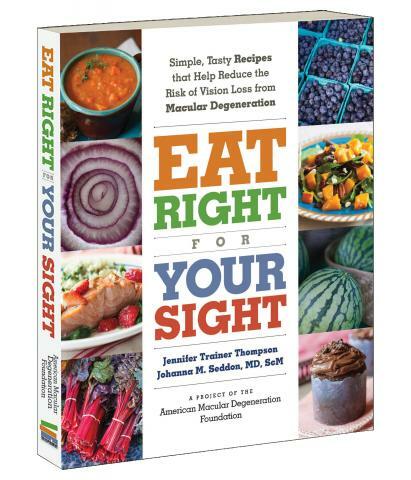 To create Eat Right for Your Sight, she teamed with journalist and cookbook author Thompson to develop recipes using key foods for eye health. They commissioned celebrity chefs and favorite restaurants to contribute recipes as well, including Alice Waters, Jacques Pepin, Debra Samuels, Lidia Matticchio Bastianich, Ina Garten, Dr. Andrew Weil, Canyon Ranch, Lake Austin Spa Resort, and the now-closed Green Street Café in Northampton, MA. Although the focus of Eat Right for Your Sight is delicious meals, Seddon and Thompson do not skimp on the science, instead explaining it in a clear and readable way. In the introduction, they describe age-related macular degeneration and the different forms it takes. They also detail the importance of certain nutrients in preserving our vision, such as how vitamin A and carotenoids are key in eye growth and development, that lutein and zeaxanthin must be replenished to maintain the health of the macula, and that polyphenols may help blood flow to the retina. Throughout, the authors explain which foods provide these nutrients and how much we need each day. The recipes in Eat Right for Your Sight are not deprivation foods. They range from old favorites like deviled eggs, macaroni and cheese, meatloaf, and cupcakes, to foods that will challenge your palate and your cooking skills, like broccoli almondine soup, Tuscan kale salad, salmon with peppered balsamic strawberries, and pear raspberry galette. The recipes also draw from a range of international cuisines, offering tamales, miso soup, Thai winter squash stew, Provence pizza, and baklava. Seddon and Thompson also explain ways to use key foods that you might not consider, and ways to combine them to the best effect, such as pairing tomatoes with olive oil, and avocados with pink grapefruit. While Eat Right for Your Sight targets those who are particularly concerned with maintaining eye health or slowing macular degeneration, it is fundamentally an excellent cookbook for anyone. With the variety and creative food combinations, it is perfect for food enthusiasts as well as those who simply want a healthier diet. Fun to read, beautiful to flip through, and most importantly a joy to cook from, Eat Right for Your Sight is an essential tool in taking care of not only your health, but also your palate. Eat right for your sight™ AND help others with macular degeneration. Purchase the Eat Right for Your Sight cookbook by clicking here. 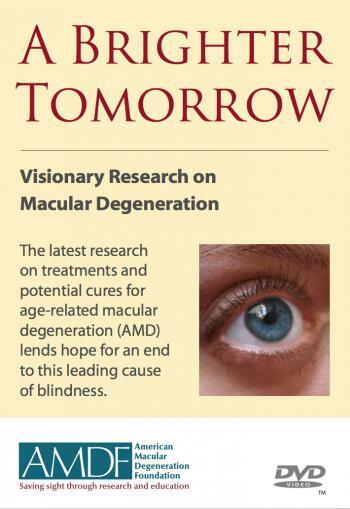 Proceeds support the mission of The American Macular Degeneration Foundation.